As a rule, I am not one of these greenies that gets overly excited about new reusable bottles. I have an old reusable bottle somewhere, and it occasionally gets used when I venture out of the house—but I’ve always been a little confused by the amount of attention paid to fancy reusable bottles and their cousins, the reusable tote. But with recent scandals over BPA in old Sigg water bottles, and with Nalgene finally going BPA free, many folks with old reusables may be looking for alternatives. So howabout going old-school? Glass may be back. 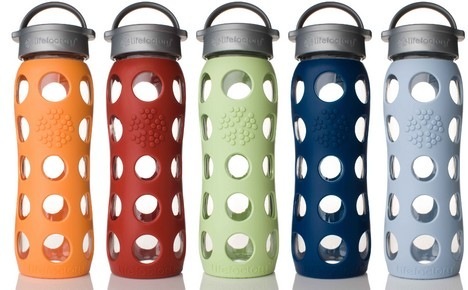 "The glass make-up of the reusable bottle means what you see is what you get. Glass is a nonporous material containing zero harmful chemicals and does not scratch, significantly reducing bacterial growth. With Lifefactory bottles you will never experience any type of leaching into your liquid nor will you ever be left with a metallic taste. Best of all, glass is a low impact raw material that is readily abundant, easy to process and 100% recyclable, which is minimally taxing on our environment." Not sure if I’ll be replacing my water bottle just yet, if I can even find it. But even I must admit, these are fine looking bottles.